NDOT Technologies, A leading web and mobile app development company successfully stepping in another milestone of 8th year ! NDOT has enlarged its products and services since then with employees. In order to comommorate the organization and its members, employees and others, Managing Director, Mr. Nandakumar Somasundaram felicitated prizes and gifts to best employees, best performing Project Managers and Team leaders. In addition to that, celebration started before one day itself by designing rangoli kolams, decorating balloons inside office premises.Poojas were performed before the anniversary event. 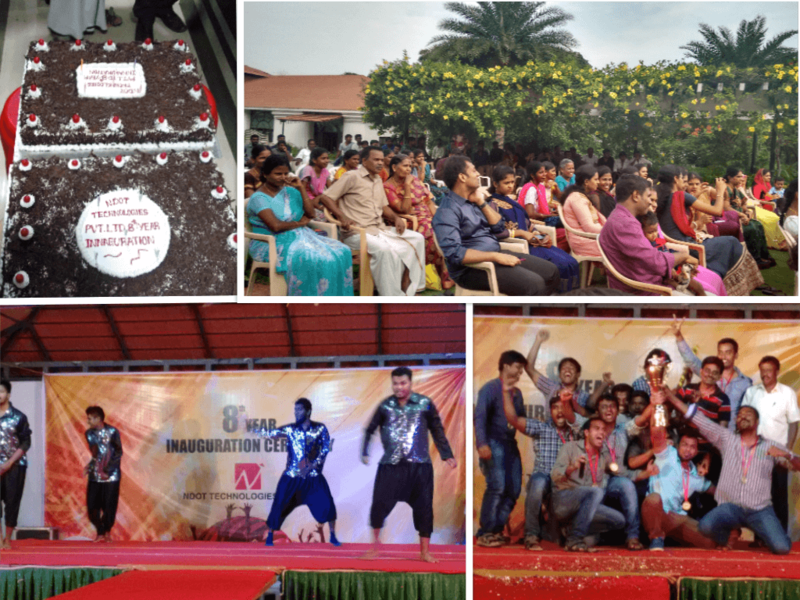 The Cultural events itself were very interesting with dance programs, dramas created by NDOT’s employees. Tournaments conducted earlier in Chess, Cricket, and other games were also declared prize winners in this event. There are wide verity of obstacles got in our way in past years. However, NDOT has crossed some important milestones along these years in web designing for e-commerce sites, online bidding, social dashboard applications and a variety of solutions for various industries. NDOT is also embarked itself on Enterprise mobility solutions.